Improved patient outcomes and reduced mortality have always been at the core of the healthcare profession. As the largest cohort of healthcare providers, nurses are at the forefront of this initiative. Many studies have reported the benefits of investing in a highly educated and motivated nursing workforce and the risks associated with suboptimal nursing environments. Nursing, in general, is highly thought of worldwide with many considering it as one of the most trusted aspects of healthcare provision with regard to integrity and honesty.,, Over the last number of decades, nursing has transformed itself into a highly educated, autonomous and independent profession focusing primarily on nursing evidence-based theory leading to better patient-centered practice. However, this worldview is not shared equally. Many countries such as the US and Australia hold a more positive public perception while others including Saudi Arabia often see nurses and the nursing discipline in a less favorable light. Although slowly changing, negative attitudes towards nursing inevitably have an impact on both the quality and volume of entrants to the profession. Internationally, nephrology nursing has been recognized as its own specialty for the past decade with many countries having developed nephrology associations which offer nurses standards of practice. Within this field, there are many nursing subspecialties such as renal transplant, anemia, vascular access, peritoneal and hemodialysis (HD), palliative care and general nephrology with nurses practicing in all healthcare settings. The nurses' role encompasses patient advocacy and education in combination with hands-on care. The following article aims to describe a potential working model for the implementation of advanced nursing practice into the Saudi healthcare system. 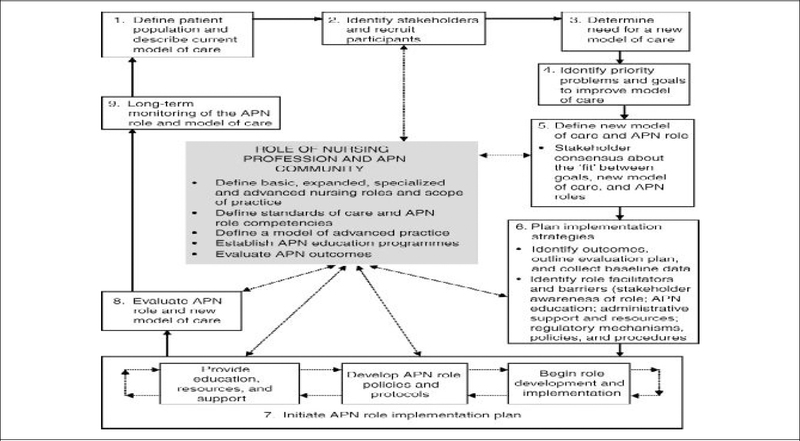 Secondary to the changing health care needs of Canada, the participatory, evidence-based, patient-focused process for guiding the development, implementation, and evaluation of APN (PEPPA) framework was developed from the foundational work of two previous models by Spitzer, (1978) and Dunn and Nicklin, (1995). The framework, developed by Bryant-Lukosius and Di Censo in 2004, is a nine-step model aiming to guide the successful integration of advanced nursing practice into healthcare [Figure 1]. 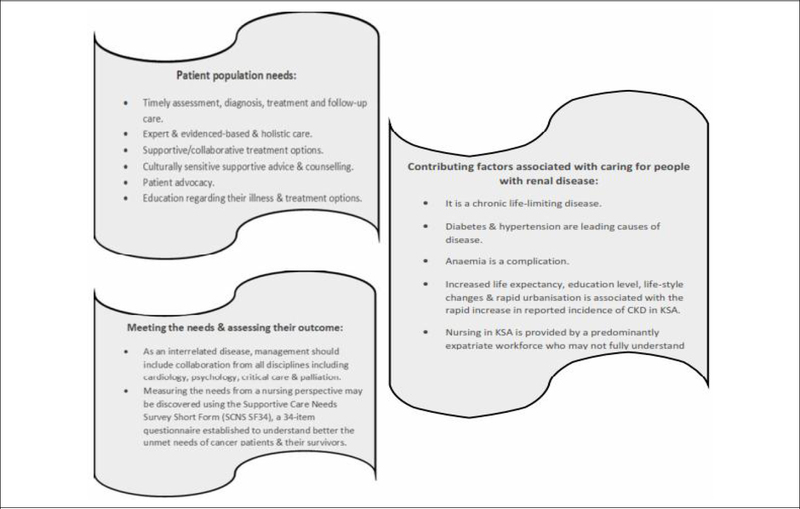 Figure 1: PEPPA (participatory, evidence-based, patient-focused process for guiding the development, implantation, and evaluation of advanced practice nursing) framework. The aim of this initial phase is to clearly identify the patient population in which the framework attempts to support. It further purposes to view and map the interaction of patients and their families with their healthcare provider along their illness trajectory. The patient population under discussion for this paper is those individuals living with CKD and ESRD. The lifespan of care begins when an individual initially presents with renal impairment and continues while they progress through their disease until their death. ESRD is a chronic, life-limiting disease. Progression of the disease is directly influenced by and effects all aspects of the bodies functionality, and therefore, management of the disease must consider other disciplines such as cardiology, diabetes, critical care, psychology, and elderly care, to name but a few. Anecdotal evidence highlights that renal disease in Saudi Arabia is managed solely by nephrology physicians with the nurses' role often seen as performing specific clinical tasks related to RRT. There is at present no official working model of care for renal nurses within the Kingdom. As per the authors of PEPPA, everyone associated with the health-care needs of a specific patient group can in some way influence their health outcome. At the center of the framework is the patient but family members, health care institutions, support staff such as palliative care and transplant teams, hospital administrators, renal associations, and governing bodies all have a part to play. Although nurse involvement is core to the framework, another fundamental belief is true collaboration among all stakeholders with full support from all to ensure its success. Potential participants for the implementation of such a framework within an acute in-patient institution may include but not limited to the director of nursing, the assistant director of nursing covering nephrology units, the head nurse of the dialysis unit, the chairman of Nephrology and the assistant director of education. While this phase is intended to include analysis of previously used models of care thus identifying both its strengths and weakness allowing for the development of a new improved model; it has been established that such a model does not exist in Saudi Arabia. Bryant-Lukosius and Di Censo (2004) identify six key areas that should be investigated which include the health-care needs of patients and their families; how these needs should be met and the outcome of meeting those needs; what are the contributing aspects associated with meeting those needs; how are the needs perceived by health-care providers; what other aspects should be looked at and finally how is this information to be gathered [Figure 2]. Figure 2: Identifiable factors to be investigated (adapted from Bryant-Lukosius and Di Censo (2004). To clearly understand the needs of the population, Bryant-Lukosius, and Di Censo (2004) suggest hosting strategic meetings between the relevant stakeholders. From these meetings, agreement regarding the goals of establishing a nursing care model are discussed. Priorities and challenges of reaching such goals including analysis of similar programs established elsewhere are debated. Early recognition of renal disease and better compliance with treatment may slow its progression and delay the onset of ESRD. The Healthy Transitions Care Management Program, was an initiative introduced in North America in attempt to improve patient education related to their chronic disease, resulting in better outcomes and reduced hospitalizations. It included the appointment of a nurse as care manager. In their randomized controlled trial (RCT) of the program in relation to CKD outcomes, Fishbane et al, (2017) found a consistent and significant increase in those availing of peritoneal dialysis and earlier renal transplantation thus reducing morbidity and mortality rates. Within the context of Saudi Arabia, the conversation related to death and dying is often more difficult. From a cultural perspective, Saudi healthcare practitioners admit to the avoidance of such a discussion particularly during times of severe illness or when death is imminent. This reluctance is borne from the notion that to acknowledge a diagnosis of fatality is to lose hope and therefore forgo God's help. Saudi families often, in an attempt to alleviate the risk of their family member losing hope, prevent medical personnel from disclosing such a diagnosis/prognosis. This poses a major ethical dilemma for healthcare workers in general and western nurses in particular. Consequently, such a conversation should be entered into as soon as possible. Greater self-efficacy which is the individuals personal understanding of their ability to cope with their illness has been proven to promote self-management and improve outcomes. Empowering patients through education related to their illness including different treatment options is the best method of achieving better self-efficacy., A fundamental feature of nursing is the creation of an effective and caring nurse-patient relationship. It is accepted that nurses provide up to 80% of all healthcare provision to an individual. Therefore, utilizing this nursing attribute early with regard to the emotional and psychological management of CKD and ESRD will have an enormous impact on the quality of care offered and in turn improve outcomes. As current research suggests, engagement in RRT may not be the most appropriate option for many older individuals suffering from coexisting conditions as prognosis and quality of life may be limited. For these individuals, CM is potentially a more viable option., However, as the premise of palliative care is the relief of symptoms and improvement in quality of life, it is considered appropriate to involve this service at any point along the disease trajectory and can very much be offered as an adjunct to curative therapy. Fostering a positive and caring relationship is central to practicing successful palliative care. Within other fields such as cancer, the integration of CNS's into the multidisciplinary team has been shown to help patients develop a deeper understanding of their disease and thus improve their experience of the service. Evidence-based best practice suggests that patients should be offered accurate and timely information related to their disease. The addition of a renal CNS may help to allow patients to make informed choices regarding their treatment modality. Step five is the actualization of step 4 in which the new model of care outlined from stakeholder strategy meetings may now be formalized into clearly defined roles. As seen in many other fields, advanced practice nursing has been shown to have a significant impact on the quality of life, reduced mortality and decreased costs. In the case of specialist nephrology nurses, there are many avenues including vascular access, HD, anemia and palliative care. The PEPPA framework has been utilized in over 16 countries internationally and is considered best practice for the introduction of new APN roles within a given healthcare system. Step 6. Plan implementation strategies. Step 6 is considered a continuation of step 5 in which both the architects of change and obstacles to it are fleshed out. This will ensure the system is ready to introduce the newly defined roles. Critical to its success, strategic meetings are again held to identify any potential barriers and relevant facilitating factors. Bryant-Lukosius and Di Censo (2004) suggest a lack of clearly defined responsibilities as a major obstacle to the implementation of CNS roles in practice. Stakeholder meetings should include all multidisciplinary staff and allow for all members to discuss implementation of the new role as well as any obstacles they may face during the change process. APN's are considered experts in their field and therefore require a minimum standard of education to ensure they are both fully prepared and can demonstrate competence in their area. The ICN suggests the minimum standard of education for advanced practice is the master's level or above. However, this is not always translated into reality. As in the case of Saudi Arabia, no such education program currently exists. This may be a potential stumbling block for the success of the program. It is possible to train nurses within an institution via apprenticeships, for example, vascular access nurse training. However, these programs often pose additional problems. In general, institution-based apparen-ticeships are often physician-led and are therefore not necessarily nursing focused. Other potential issues surrounding this, and similar training programs relate to their quality and standardization to other institutions. One predictor of success of introducing advanced nursing practice is their subjective confidence in their ability to perform at an advanced level. Such confidence comes from knowledge and the appreciation of their value among the multiple disciplinary team. Governing bodies such as the American Nephrology Nurses Association (ANNA) have educational arms and have developed post graduate training programs of varying levels to support its nurses in their chosen field. Administrative support is fundamental to the frameworks success. Such support comes in many ways. Once such area of support could be to facilitate the education of its nurses in countries that offer masters programs. Identifying and creating clearly defined reporting structures for the new APN's is also essential for the achievement of framework goals. Particularly as APN's often report to both physician and nursing managers with both having competing expectations. It is generally expected that all strategies from step 6 are put in place in sequential order i.e. stakeholders are made aware of the new APN role, new APN's have gained sufficient knowledge, education, and experience; and institutional policies and procedures surrounding the role are determined. However, this process can take years depending on the state of APN development. Movement through the development stage is therefore fluid as evaluation and re-evaluations take in to account the success and support of and for the role. Both steps are reflective in nature and involve investigating the impact of the new model of care. Areas of focus should include patient safety, patient satisfaction, and cost. The PEPPA framework is a proven method of integrating advance practice into health-care. However, successful implementation of any such framework is contingent on stakeholder acceptance. Nurse-physician collaboration is essential to the improvement of clinical outcomes including decreased mortality rates and better service satisfaction. Such collaboration is based on mutual respect and trust of each participants level of knowledge, expertise and on the acceptance that each side offers an equal contribution to the partnership. Nurses and physicians, although sharing a common goal often have differing perspectives on how to reach that goal. Nurses take a holistic approach to patient care, taking into account both the physical and psychological aspects of both illness and treatment. Physicians in contrast tend to be problem-focused relying on measurable disease characteristics. Traditionally physicians are seen at the top of the hierarchy and therefore feel they are the sole decision-makers with other members of the multi-disciplinary team there to fulfil their orders. As a result, nurses knowledge and expertise are often undermined and under-valued. Developing nephrology nurse's skills through further education will attempt to dispel some of these barriers. The introduction and development of institutional clinical ladders for nephrology nurses is one method of ensuring this. To facilitate and encourage nurses to continually improve their skills and knowledge and aide in the recruitment and retention of nurses, clinical pathways were developed in the 1970's. Most of which were based on Benner's novice to expert model of competence. Benner, realizing the perpetually changing needs of acute healthcare and understanding that it was no longer possible to standardize the role of every nurse, she applied the Dreyfus model of skill acquisition to nurses. The model describes six levels of progression including novice; advanced beginner; competent; proficient and expert. 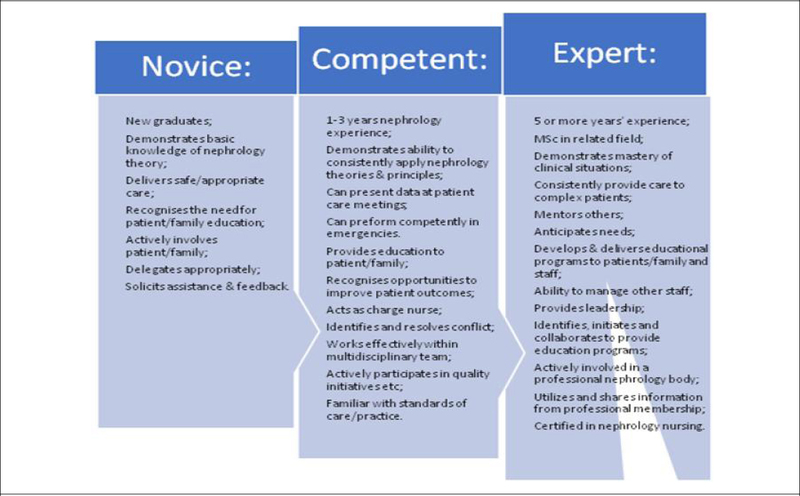 Applying the model to a nephrology setting, the ANNA, the Renal Society of Australia and the British Renal Society have all stipulated within their scope of practice guidelines, that one must exhibit certain skills and achieve various competencies at varying levels of experience. Areas' in which the clinical ladder often focus include clinical behaviors; patient education; leadership, teamwork and collaboration; communication, knowledge development and professional behavior. [Figure 3]. is an example of a potential nephrology clinical ladder. Currently, steps are in progress to introduce advanced speciality nursing practice programs at the master's level and higher through some of the well-established Universities within the Kingdom. However, these courses are in the early phase of development and will require some years before becoming established. Introducing the PEPPA framework within the context of Saudi Arabia may help support the development of advanced nursing practice which will have a positive impact on retention of local nursing personnel and improved patient outcomes. Boamah S. Linking nurses' clinical leadership to patient care quality: The role of transformational leadership and workplace empowerment. Can J Nurs Res 2018;50:9-19. Aiken LH, Sloane D, Griffiths P, et al. Nursing skill mix in European hospitals: Cross-sectional study of the association with mortality, patient ratings, and quality of care. BMJ Qual Saf 2017;26:559-68. Eales S. Investing in a highly qualified workforce. Queensland Nurs 2016;35:39. Hayter M. The UK Francis report: The key messages for nursing. J Adv Nurs 2013;69:e1-3. Walker RC, Marshall MR, Polaschek NR. A prospective clinical trial of specialist renal nursing in the primary care setting to prevent progression of chronic kidney: A quality improvement report. BMC Fam Pract 2014;15: 155. Sharma S, Sarnak MJ. Epidemiology: The global burden of reduced GFR: ESRD, CVD and mortality. Nat Rev Nephrol 2017;13:447-8. Wetmore JB, Collins AJ. Global challenges posed by the growth of end-stage renal disease. Ren Replace Ther 2016;2:15. Hamdi NM, Al-Hababi FH, Eid AE. HLA class I and class II associations with ESRD in Saudi Arabian population. PLoS One 2014;9: e111403. Al-Mahmoud S, Mullen P, Spurgeon P. Saudisation of the nursing workforce: Reality and myths about planning nurse training in Saudi Arabia. J Am Sci 2012;8:369-79. Almalki M, FitzGerald G, Clark M. The nursing profession in Saudi Arabia: An overview. Int Nurs Rev 2011;58:304-11. Felemban E, O'Connor M, McKenna L. Cultural view of nursing in Saudi Arabia. Middle East J Nurs 2014;8(4):8-14. Cruz JP, Alquwez N, Cruz CP, Felicilda-Reynaldo RF, Vitorino LM, Islam SM. Cultural competence among nursing students in Saudi Arabia: A cross-sectional study. Int Nurs Rev 2017;64:215-23. Al Yami MS, Watson R. An overview of nursing in Saudi Arabia. J Health Spec 2014;2:10. Kleinpell R, Scanlon A, Hibbert D, et al. Addressing issues impacting advanced nursing practice worldwide. Online J Issues Nurs 2014; 19:5. Girvin J, Jackson D, Hutchinson M. Contemporary public perceptions of nursing: A systematic review and narrative synthesis of the international research evidence. J Nurs Manag 2016;24:994-1006. Gomez NJ, Castner D, Hain D. Nephrology nursing scope and standards of practice: Integration into clinical practice. Nephrol Nurs J 2017;44:19-26. Al Mutair A, Redwan F. Undergraduate Saudi nursing students attitudes towards nursing profession. J Nurs Care 2016;5:2167-8. Hoeve YT, Jansen G, Roodbol P. The nursing profession: Public image, self-concept and professional identity. A discussion paper. J Adv Nurs 2014;70:295-309. Aldossary A, While A, Barriball L. Health care and nursing in Saudi Arabia. Int Nurs Rev 2008;55:125-8. Mansour EA, Gemeay EM, Behilak S, Albarrak M. Factors affecting attrition rate among nursing students college of health sciences, Taibah university, Saudi Arabia. Int J Nurs 2016;3:65-72. Alboliteeh M, Magarey J, Wiechula R. The profile of Saudi nursing workforce: A cross-sectional study. Nurs Res Pract 2017;2017: 1710686. Aiken LH, Sloane DM, Bruyneel L, et al. Nurse staffing and education and hospital mortality in nine European countries: A retrospective observational study. Lancet 2014;383: 1824-30. Griffiths P, Ball J, Murrells T, Jones S, Rafferty AM. Registered nurse, healthcare support worker, medical staffing levels and mortality in English hospital trusts: A cross-sectional study. BMJ Open 2016;6:e008751. Stavropoulou A, Grammatikopoulou MG, Rovithis M, Kyriakidi K, Pylarinou A, Markaki AG. Through the patient's eyes: The experience of end-stage renal disease patients concerning the provided nursing care. 2017. Healthcare (Basel) 2017 Jul 21;5(3). pii: E36. Rodrigues TA, Botti NC. Providing and receiving nursing care during hemodialysis. Acta Paul Enferm 2009;22:528-30. Fishbane S, Agoritsas S, Bellucci A, Halinski C, Shah HH, Sakhiya V, et al. Augmented nurse care management in CKD stages 4 to 5: A randomized trial. Am J Kidney Dis 2017; 70:498-505. Wachterman MW, Lipsitz SR, Lorenz KA, et al. End-of-life experience of older adults dying of end-stage renal disease: A comparison with cancer. J Pain Symptom Manage 2017;54:789-97. Douglas B, Bonner A. Nephrology-specific Clinical Performance Indicators for Nurse Practitioner Education in Australia: A Resource for Students and Clinical Support Team Members; 2017. Leatherland S. Continuing care of the renal patient: A guide for nurses. Dial Transplant 2007;36:572-83. Hibbert D, Al-Sanea NA, Balens JA. Perspectives on specialist nursing in Saudi Arabia: A national model for success. Ann Saudi Med 2012;32:78-85. Sheer B, Wong FK. The development of advanced nursing practice globally. J Nurs Scholarsh 2008;40:204-11. Bryant-Lukosius D, Dicenso A, Browne G, Pinelli J. Advanced practice nursing roles: Development, implementation and evaluation. J Adv Nurs 2004;48:519-29. Salamanca-Balen N, Seymour J, Caswell G, Whynes D, Tod A. The costs, resource use and cost-effectiveness of clinical nurse specialistled interventions for patients with palliative care needs: A systematic review of international evidence. Palliat Med 2018;32:447-65. Clark CE, Smith LF, Taylor RS, Campbell JL. Nurse led interventions to improve control of blood pressure in people with hypertension: Systematic review and meta-analysis. BMJ 2010;341:c3995. McNamara S, Giguère V, St. Louis L, Boileau J. Development and implementation of the specialized nurse practitioner role: Use of the PEPPA framework to achieve success. Nurs Health Sci 2009;11:318-25. Boyko JA, Carter N, Bryant-Lukosius D. Assessing the spread and uptake of a framework for introducing and evaluating advanced practice nursing roles. Worldviews Evid Based Nurs 2016;13:277-84. Bryant-Lukosius D, Dicenso A. A framework for the introduction and evaluation of advanced practice nursing roles. J Adv Nurs 2004;48: 530-40. Allison MM. Mapping the literature of nephrology nursing. J Med Libr Assoc 2006; 94:E74-9. Serena A, Castellani P, Fucina N, et al. The role of advanced nursing in lung cancer: A framework based development. Eur J Oncol Nurs 2015;19:740-6. Rao AD, Kumar A, McHugh M. Better nurse autonomy decreases the odds of 30-day mortality and failure to rescue. J Nurs Scholarsh 2017;49:73-9. Morrison SM, Symes L. An integrative review of expert nursing practice. J Nurs Scholarsh 2011;43:163-70. Lucatorto MA, Watts SA, Kresevic D, Burant CJ, Carney KJ. Impacting the trajectory of chronic kidney disease with ARPN-led renal teams. Nurs Adm Q 2016;40:76-86. Naylor MD, Aiken LH, Kurtzman ET, Olds DM, Hirschman KB. The care span: The importance of transitional care in achieving health reform. Health Aff (Millwood) 2011; 30:746-54. Stauffer ME, Fan T. Prevalence of anemia in chronic kidney disease in the United States. PLoS One 2014;9:e84943. Bennett L, Alonso MA. Current practice in renal anaemia management: Two multinational surveys. EDTNA ERCA J 2005;31:99-103. Erlingmark J, Hedström M, Lindberg M. Nurse staffing and renal anaemia outcomes in haemodialysis care. J Ren Care 2016;42:185-9. Krishnan AR, Trinder D, Chua AC, Chakera A, Ramm GA, Olynyk JK. Anaemia of chronic kidney disease: What we know now. J Ren Hepat Disord 2017;1:11-9. Lazenby S, Edwards A, Samuriwo R, et al. End-of-life care decisions for haemodialysis patients – 'We only tend to have that discussion with them when they start deteriorating'. Health Expect 2017;20:260-73. Zhou G, Stoltzfus JC, Houldin AD, Parks SM, Swan BA. Knowledge, attitudes, and practice behaviors of oncology advanced practice nurses regarding advanced care planning for patients with cancer. Oncol Nurs Forum 2010; 37:E400-10. Obrador GT. The provider's role in conservative care and advance care planning for patients with ESRD. Clin J Am Soc Nephrol 2016;11:750-2. Stallworthy EJ. Advance care planning. Nephrology (Carlton) 2013 Apr 16. doi: 10.1111/nep.12074. Noble H, Brazil K, Burns A, et al. Clinician views of patient decisional conflict when deciding between dialysis and conservative management: Qualitative findings from the Palliative Care in Chronic Kidney Disease (PACKS) study. Palliat Med 2017;31:921-31. Aljubran AH. The attitude towards disclosure of bad news to cancer patients in Saudi Arabia. Ann Saudi Med 2010;30:141-4. Feo R, Rasmussen P, Wiechula R, Conroy T, Kitson A. Developing effective and caring nurse-patient relationships. Nurs Stand 2017; 1:54-63. Wong CF, McCarthy M, Howse ML, Williams PS. Factors affecting survival in advanced chronic kidney disease patients who choose not to receive dialysis. Ren Fail 2007;29:653-9. Mok E, Chiu PC. Nurse-patient relationships in palliative care. J Adv Nurs 2004;48:475-83. Punshon G, Endacott R, Aslett P, et al. The experiences of specialist nurses working within the uro-oncology multidisciplinary team in the United Kingdom. Clin Nurse Spec 2017;31: 210-8. Peeters MJ, van Zuilen AD, van den Brand JA, et al. Nurse practitioner care improves renal outcome in patients with CKD. J Am Soc Nephrol 2014;25:390-8. Bryant-Lukosius D, Spichiger E, Martin J, et al. Framework for evaluating the impact of advanced practice nursing roles. J Nurs Scholarsh 2016;48:201-9. Furlong E, Smith R. Advanced nursing practice: Policy, education and role development. J Clin Nurs 2005;14:1059-66. Gilbert JH, Yan J, Hoffman SJ. A WHO report: Framework for action on interprofessional education and collaborative practice. J Allied Health 2010;39 Suppl 1:196-7. Sollami A, Caricati L, Sarli L. Nurse-physician collaboration: A meta-analytical investigation of survey scores. J Interprof Care 2015;29:223-9. Stein-Parbury J, Liaschenko J. Understanding collaboration between nurses and physicians as knowledge at work. Am J Crit Care 2007;16: 470-7. Cote DA, Burwell KT. A revised nephrology nurses' clinical ladder. Nephrol Nurs J 2007; 34:243-8. Benner P. From novice to expert. Am J Nurs 1982;82:402-7. Strouse SM, Nickerson CJ. Professional culture brokers: Nursing faculty perceptions of nursing culture and their role in student formation. Nurse Educ Pract 2016;18:10-5. Hamaideh SH, Al-Omari H, Al-Modallal H. Nursing students' perceived stress and coping behaviors in clinical training in Saudi Arabia. J Ment Health 2017;26:197-203. Bolton WK. Nephrology nurse practitioners in a collaborative care model. Am J Kidney Dis 1998;31:786-93. Coyne I, Comiskey CM, Lalor JG, et al. An exploration of clinical practice in sites with and without clinical nurse or midwife specialists or advanced nurse practitioners, in Ireland. BMC Health Serv Res 2016;16:151. Hibbert D, Aboshaiqah AE, Sienko KA, et al. Advancing nursing practice: The emergence of the role of advanced practice nurse in Saudi Arabia. Ann Saudi Med 2017;37:72-8.